Fat grafting involves removing fat from your body from one location and transferring it to another location of your body. Fat acts as an ideal filler, which is often in abundant supply and can be harvested with minimal complications from the abdomen, thighs, flanks, or buttocks of a patient. The process of removing the fat is similar to that used for cosmetic removal of fat known as liposuction. Similar surgical cannulas are used to remove the fat and then the fat is processed to obtain the purest fat to inject. The fat is then injected (grafted) into another location in very small quantities where it will obtain nutrients and a blood supply to survive. About 50-60% of the fat will survive and remain where it is placed and the remaining fat cells will be removed by the body. Most commonly, fat grafting is used in combination with other forms of reconstruction to correct contour deformities including depressions and implant rippling, to increase volume, improve radiated skin and improve scars in patients who have undergone breast conservation or mastectomy. For example, in patients who are reconstructed with implants, fat grafting is often used to fill the deformities and depressions above the implants on the chest wall where the natural breast would extend and to hide some of the ripplings of an implant that may be seen in women with thinner skin. 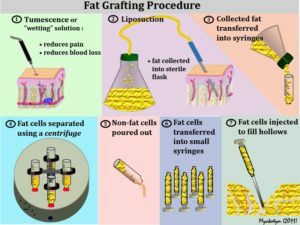 The use of fat grafting is most successful in patients who have areas of fat that can be harvested and grafted. Some patients may be candidates for full breast reconstruction with fat alone, however, this requires multiple surgeries to accomplish the size of breast desired. In addition, some surgeons require an external expansion device known as a Brava bra to be worn greater than 18 hours a day to provide space for fat to be injected to create an entire breast. The majority of patients will have a better result with using another form of breast reconstruction for full breast reconstruction rather than fat alone. In general, fat grafting is very safe with few complications with minimal recovery time. The biggest risk is that the fat may not survive which may result in the need to have additional surgery or result in a less than expected outcome. Other risks include bruising, contour deformities, changes in sensation, and possible oil cysts and lumps from fat necrosis. Because some fat cells can stimulate cell growth, some physicians have expressed concerns that fat injection into breast cancer patients may increase the risk of stimulating dormant cancer cells to grow. Most of the research in this area has not shown this to be true but ongoing research continues. Do you perform fat grafting in your breast cancer patients? Would fat grafting help my reconstructive outcome? Do I have areas of fat that can be harvested safely to help my reconstruction?